The Lamprey Gun Turret was designed for the M-16, but functions well on sporting carbines, bolt action or lever action rifles, over and under, side by side, pump style and semi-automatic shotguns. It has a lockable ball and socket to allow firing from a variety of positions and a pivoting platform for smooth gun rotation. ESP created the AEGIS Ultimate Liner as a more natural alternative for your patients. The preflexed design insures an anatomically correct and custom-like fit, maximizing comfort and mobility. Call today to try the NEW Ultimate Liner! A new solution for transradial amputees is now available at SPS: the NEW Alpha® Upper Extremity Liners from Ohio Willow Wood. As the newest member of the Alpha® Family of Liners, the Alpha UE Liner is formulated of the unique Alpha gel, which surrounds the residual limb in a skin-friendly layer of protection. A unique oval-shaped distal umbrella matches upper-limb anatomy more precisely, yielding maximum comfort and fit. Amputees may choose from either the Original or Spirit fabrics for the outer covering. Priced at the same great value as all other Alpha Liners, the new UE Liners are a smart choice. 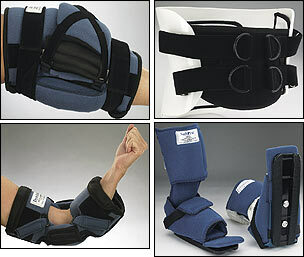 ReverseStepLock® is now available in 2400 Series® Size 6 for use in upper-extremity orthoses. 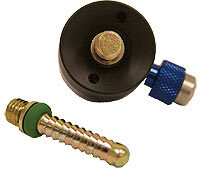 Pair this unique component with the new 2400 Series Free Motion joint. Free Motion joints are available in both the 2400 Series for use with thermoplastic and 2755 Series® for use in pre-preg or wet laminations. Available in Sizes 5, 6, and 7 for child, youth, or adult, the Free Motion joint features sleek European styling and is designed to be snag-free. These components are quality manufactured of light, strong electroless nickel-plated OTS alloy for comfortable fit and durable finish. Solar System AFOs—Products That Revolve Around You! Solar SystemTM AFOs is proud to introduce its Exoskeletal Dynamic Ankle Foot Orthosis line. The system was designed by Hernan Luna, CPO, LPO--resulting in an alternative, more dynamic solution for treating patients and improving gait. The patent-pending Solar System AFO line incorporates a rigid structural "exoskeleton" with a more flexible molded inner component, which together offer greater versatility and overall mobility through ROM for patients using orthoses. The full line of custom-molded orthoses is now available to orthotists, and an Information Request Form can be completed online. Prosthetists, are you tired of replacing Gel suspension sleeves at your expense? What's the answer? SleeveSavers are here! SleeveSavers are designed to protect the inside of your patients gel suspension sleeve by covering the proximal edges of the socket. 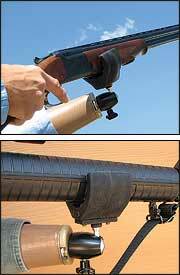 A specially developed heavy-duty material with four-way stretch is used for this application. This inexpensive solution can help to protect your patients sleeve for up to and beyond six months. By distributing one with each suspension sleeve, you can cut your replacements by 80 percent! To protect the outside of your patients suspension sleeve, consider SleeveArt® prosthetic suspensionsleeve covers. SleeveArt by Freds Legs Inc.
SPS announces the immediate availability of the smallest and newest lock in the Ohio Willow Wood product line: the Mini G-Lock designed for upper-extremity and pediatric prostheses. 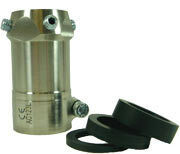 Incorporating a standard pin lock design, the Mini G-Lock allows the pin to be secured at the nearest groove to prevent pistoning, shifting, or slippage. When used with the new Alpha® UE Liner, transradial amputees receive the full benefit of a complete upper-extremity solution. To save time and energy during fabrication, a dummy is included with each lock. 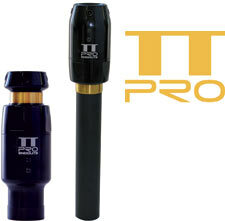 Each Mini G-Lock includes two pins to facilitate ease of use with the Alpha family of liners. When you are looking for value, you need only look to SPS--introducing the VALUE-PRICED new green Cylindrical Lock from Fillauer. The green Cylindrical Lock incorporates the dependable Fillauer locking mechanism in a versatile cylindrical body with a 4-hole attachment base. This value-added design features a fiber-reinforced, injection-molded cowl, deeper pin well for easier insertion, and stronger 4-hole attachment. The new green Cylindrical Lock can be retrofit into other cylindrical lock sockets and is optimized for thermoforming or lamination. With its focus on value, the Cylindrical Lock comes ready to fit with two 1-in. Fillauer shuttle pins and attachment hardware. 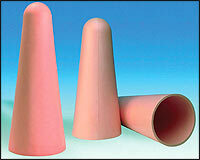 PEL Supply now offers Keasy Thermoformable Cone Liners. These thermoformable cones are used as a liner between the residual limb and socket, worn with a fabric prosthetic sock. Mainly for active patients, these durable liners are seamless and smooth inside; no gluing required. Modifiable for a comfortable fit, they are thermoformable between 300°-340° for four to five minutes and can be reheated four to five times without affecting characteristics. Just introduced to the US is the larger AK Liner, plus a new Intermediate Liner used as an interface between the socket and a gel or silicone liner to prolong the life of the liner. Orthofeet is introducing innovative athletic shoes, which are designed from the inside out to provide unsurpassed comfort and protection. Soft genuine leather along with elastic elements in the vamp enhance comfort and eliminate pressure on bunions. Anatomical, straight last, with over 5/16 in. added depth, provides relaxed fit and ample room for thick orthotics. Unique smooth lining construction, padded with extra foam, enhances comfort, and provides excellent protection. Lightweight sole, with wide base and mild rocker design, enhances stability and facilitates ambulation. The athletic shoes are available in four widths. 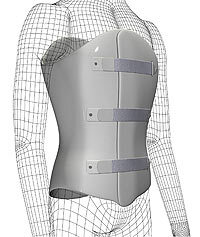 Custom Spinal Orthoses for Less than Prefab! Leading orthotists, orthopedic surgeons, and neurosurgeons agree: custom-molded LSOs and TLSOs are superior to prefabricated versions in biomechanical motion control and patient compliance. Prefabricated spinal orthoses do not control lateral flexion and rotation and are unable to control motion in all planes as well as a custom. They do not accommodate pendulous patients or provide adequate means to lock on the patient pelvis. 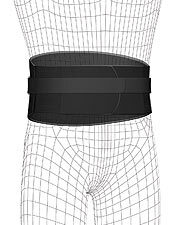 The Spinal Solutions Custom Anterior Overlap LSO/TLSO is the most cost-effective way to provide superior fit and support. An all-inclusive price enables cost-effectiveness while providing the patient with the ultimate in triplanar motion control. The EZ Stride composite has helped thousands of patients enjoy the freedom of walking without restriction. Now, more patients are candidates to enjoy that freedom with the new EZ Stride-ATB (Anterior Tibia Brace), applicable to footdrop patients. 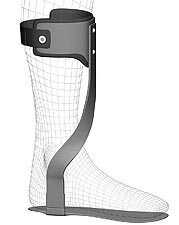 This AFO effectively assists the patient return to a more normal gait cycle while minimizing pressure on the tibia. The EZ Stride-ATB, a dynamic floor reaction device that is stronger, lighter, and thinner, is designed to prevent excessive "push out" of the shoe. The EZ Stride-ATB can be fabricated as a lateral or medial support strut, prefabricated, custom to cast, or custom to measurement. SADMERC-approved L-1932. 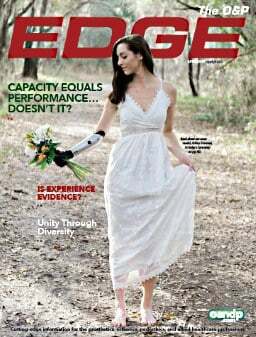 The Versa ClampTM, new from Freedom Innovations, provides two fitting solutions when used in conjunction with the companys SilhouetteTM Prosthetic Foot. The extended 34mm tube clamp can be paired with pre-cut spacer rings to provide an easy fix for clinicians that have cut the pylon of the Silhouette too short. Simply insert the 1/8-in., 1/4-in., or 3/8-in. rings, or any combination of the three, into the clamp to build back to the needed pylon height. The Versa Clamp also allows easy use of the Silhouette Prosthetic Foot with pin locking systems, which require pin extension past the pyramid adaptor. Available for purchase from Freedom Innovations or through SPS. CareCredit, the nation's leader in patient financing, offers a new brochure illustrating how O&P practices can use patient payment plans to help more patients overcome cost concerns and obtain the optimal technology they need. Featuring data from industry studies and practice and patient research, the new brochure details how offering CareCredit as a value-added service has been proven to increase care acceptance and revenue, reduce accounts receivable and collection costs, and improve cash flow. CareCredit offers a comprehensive range of 3-, 6-, 12-, and 18-Month No Interest and 24-, 36-, 48-, and 60-Month Extended Payment Plans to fit patient budgets. 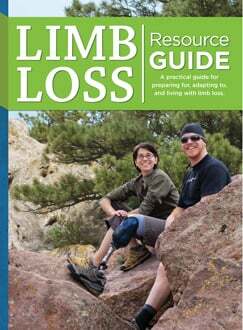 Ohio Willow Wood has adapted its revolutionary lower-extremity Alpha® Liners for use by above-elbow and below-elbow amputees. The Alpha UE Liner surrounds a residual limb in a layer of skin-friendly, mineral-oil-based gel containing Vitamin E. The liner gently adheres to the skin to protect against abrasion and breakdown. The Alpha UE Liner is offered in a uniform, 3mm gel thickness and in three sizes. An oval-shaped umbrella allows for a comfortable fit. Alpha UE Liners are heat-moldable, allowing prosthetists to tailor a liner's fit within their facilities.